Regardless of the response I would then ask them if they knew how blogs were available at their university. 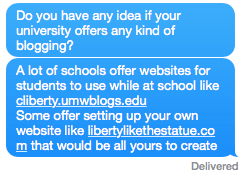 In asking about blogs I also made the distinction between blogs that were university owned, like Mary Washington’s UMW blogs program, and blogs that belonged solely to the students. The primary response of the students I talked to was that they were generally unsure about if or how their universities offered blogging to students. Mostly students had a response that they did not have personal sites. Some expressed surprise that a university would offer students blogs of their own that were not subordinate to university connection. One student from the University of William and Mary mentioned that they did have wiki pages that students used for classes, but as far as she knew that was how their university offered blogging. A few other students from other universities mentioned having used blogs either in a group project. Several stated that those sites were WordPress sites, including students from the University of Virginia and Florida State University respectively. Mostly if the students had used blogs they struggled to recall what platform they used, stating it was a one off use and more for the class then anything about building their digital identities. Aside from just talking to I tried to do research into each university’s digital programs and blogging however I ran into troubles locating that information. Perhaps this was because I had trouble coming up with how to find this information. What key words to use and how to describe student blogging made me question what I was trying to understand. Mostly what I would end up finding were articles that included words I referenced but really did not provide detailed information on how students have access to blogging. Also I found a few articles coming out different university’s technology program advocating for programs similar to Domain of One’s own however there was no implementation. In fact that was the whole reason I decided to contact other students, because I was struggling to find the information I decided to go to the users themselves the students. As I discussed in my last post the University of Mary Washington offers the program of Domain of One’s Own to give students control over the digital presence.Blogging is such a part of University of Mary Washington that I wondered how or if other universities offered programs that were similar. Domain of One’s own is hosted through Reclaim Hosting, their site lists 20 universities who use Domain of One’s own. Clearly UMW was one of those universities. After doing some research I found that Emory University was another. However I had difficulties finding the other participating universities. From the short time I had to look into other universities and people I was able to get information from I learned some interesting things. I realized that perhaps some of these universities do offer some form of digital opportunity, but often it appears that it is in a more case by case situation. Students use blogs for particular classes but those blogs are focused on class material not on the students representing themselves digitally. I am sure that there are other universities, outside of the ones I got information on, that incorporate blogging in many courses and that encourage student to build a digital presence. As a student who has benefitted and grown through my experiences using blogs at the University of Mary Washington I think it would be amazing if students at other universities had the same chance to experience blogging and digital identity building in the same or similar way.